Two earthquakes, a magnitude 5.5 and a magnitude 5.4, struck near the Red Dog Operations zinc-lead mine in remote northwest Alaska, the U.S. Geological Survey said. It said the quakes, which struck minutes apart, were centered just a few miles (km) southeast of Red Dog Mine, the world's largest producer of zinc, which is operated by Canadian mining company Teck Resources. Teck Resources said on Friday its Red Dog zinc mine, the world's largest, in Alaska is operating as usual after two earthquakes struck a few miles from the site. 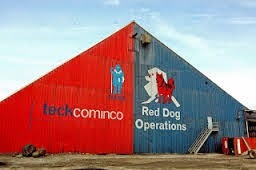 "Mild tremors were felt at Red Dog operations. There were no safety concerns and the mine is currently operating as normal," a spokesman said in an email.